Gore Tex is the fabric that holds the American Democratic Party together. It is remarked for its waterproof and breathable characteristics, which are also idiosyncrasies of Al Gore. Originally thought to be a product of the Heinz company, Gore Tex was in fact developed by Al Gore in 1975 whilst employed by Apple Electric Abacus Company. Gore, who was working on a new dust jacket for the Apple IIe, accidentally left some dust on the window sill of his laboratory window, only to find weeks later it had become Penicillin. After a few more weeks it had become the Internet, which later him secured a three book deal and the Nobel Prize. 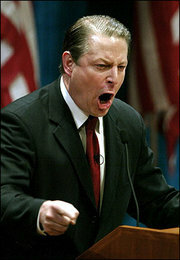 Not intent to rest on his laurels, Al Gore bought himself a queen sized bed and a set of satin sheets. Unfortunately these provided little comfort for Gore during the winter months and he longed for bedclothes that provided greater shelter from the elements. Al Gore went back into the Lab and worked fastidiously. After 3 months Gore Tex was born. Al Gore presented to the public a durable cloth that could not only be wiped clean, had a breathable upper layer, and could be made into anything the imagination dictated. Gore did initially meet some obstcales in securing large quanity of human skin to mass manufacture Gore Tex, but as history has shown, the slaughter of innocents provides great opportunities. With the ongoing war in Vietnam, large numbers of veterans were willing to donate their limbs for a higher war pension, and Gore was able to bring his new product to a worldwide market. The dreams that stuff is made of. The use of Gore Tex has opposition amongst certain right wing lobby groups, such as the Pro-Life Lobby and Vinyl Promotion Society. Pressure groups such as these claim that the use of Gore Tex as a product is 'inhumane'. During congress in 1998, Al Gore responded to these views by stating that by using human flesh for the production of Gore Tex, was, in fact, by its very essence, 'quite humane'. The back door of most major Hospitals. The price of Gore-Tex fluctuates with the availability of the source materials from respective countries. An approximate cost can be calculated with the following formula. ND is the National Debt. This page was last edited on 24 October 2015, at 17:11.